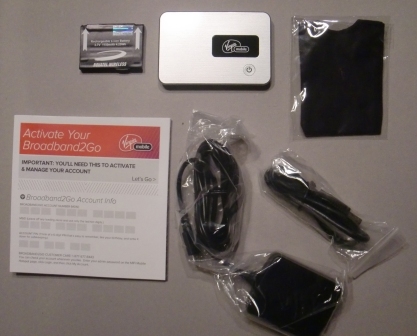 Virgin Broadband - Broadband2Go Review! 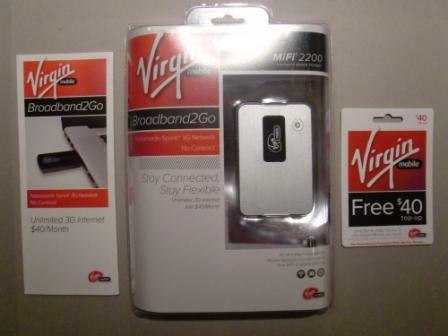 NOTE: In February 2016, Virgin Mobile announced the discontinuation of its Broadband2Go product. They're still supporting existing customers though. 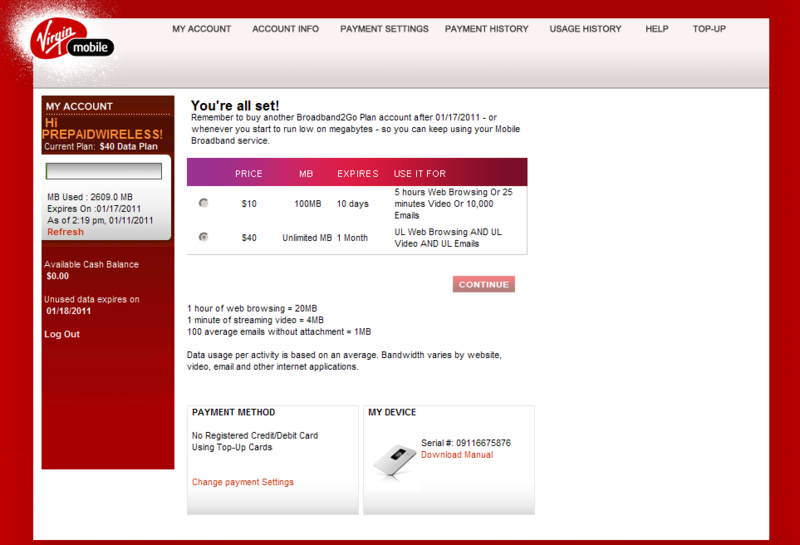 I actually felt they had a good mobile broadband offer, and I'm sad to see it go. Fortunately, there are a lot of other hotspot services available that you can check out at Best MiFi Plans. Are you looking for a detailed Virgin broadband review? After receiving numerous posts to this site regarding issues with Virgin Mobile's Broadband2Go product, I felt compelled to get some first-hand experience with their service. Ideally I would have personal experience with every prepaid broadband product on the market so that I can contribute even more greatly to the forum discussions. It would also be great if I had each product available on hand so that I can test different scenarios as people post questions or issues. Unfortunately, this isn't always practical. Mostly, it's difficult to get carriers to provide test equipment, and I'm not yet at the place where it's affordable for me to purchase the equipment and plans; hopefully at some point in the future this will be a possibility! Due to the significant number of posts, and the extremely high rank that this site gets related to prepaid broadband topics, and even ranking higher in Google for a number of Broadband2Go keywords/topics than Virgin's own site, I reached out to Virgin via Twitter for some help. They graciously agreed to send me a prepaid modem (a Novatel MiFi 2200) and one month of service. As I have the Sprint version of the Novatel MiFi 2200 MiFi modem available that I've been using for about a year, I have a great point of reference for comparison. They offered to have it preactivated for me, however, I expressed my interest in having a true customer experience and going through all of the steps on my own as would any customer. Here you'll find my experience! Please Note: Although Virgin Mobile sent me the modem for review, please rest assured that I am in no way affiliated with them, nor am I being compensated by them to provide a positive review. As is, has always been, and will always remain the case, this site is a neutral, objective, non-biased resource for prepaid wireless and prepaid broadband information. In other words, please rest assured that the feedback you read here is genuinely my experience, good, bad, or otherwise! Virgin sent me the modem in the retail packaging, which is a plastic clamshell, along with a Broadband2Go pamphlet and a $40 topup card. Being very familiar with clamshell packaging, I knew to immediately enlist the help of some sturdy scissors to open it up. I immediately discarded the plastic shell as it can have very sharp edges that I don't want my two-year-old around. Generally speaking, I found the packaging to have clear messaging and a clean, simple look, which I liked. It's often the case where packaging (for wireless or any other product for that matter) becomes too cluttered and noisy that it gives me a headache just looking at it. I inserted the battery and charged it for a number of hours before using it. Getting a good initial charge on lithium ion batteries is very important for battery conditioning. I then followed the activation instructions on the pamphlet, which were very clear easy to understand. The SSID and password were printed on sticker affixed to the back of the MiFi device, which made things very easy. I logged into the MiFi administrator page (http://virginmobile.mifi), and followed the activation wizard. I liked the easy to remember site address,which is usually http://192.168.1.1 for other MiFi devices (ex. Sprint, Verizon). The steps were easy to follow and virtually identical to the Sprint MiFi process that I have also experienced in the past. In fact, you can load the http://192.168.1.1 address, however, it resolves to the same Virgin interface. 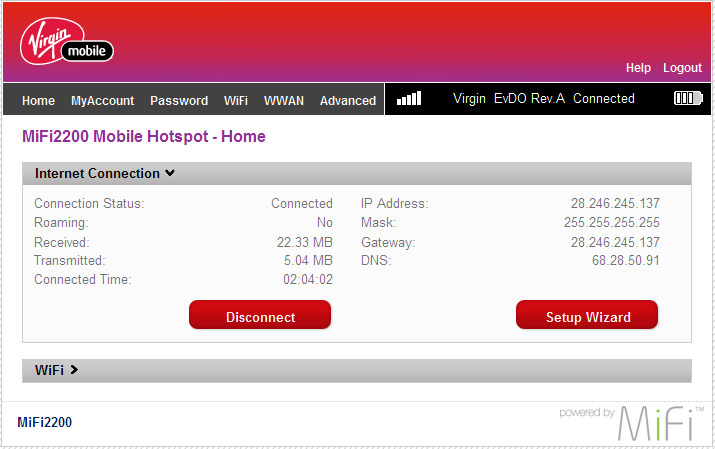 If I connect to the Sprint MiFi and login to the Sprint admin page, and then connect to the Virgin Broadband2Go MiFi, the admin page is still Sprint branded but indicates that I'm connected to the Virgin MiFi. However, refreshing the page, or clicking on any menu option results in the reappearance of the Virgin mobile MiFi branded site. Probably not that useful for anyone per se, but an interesting tidbit nonetheless. Everything went smoothly until the end where it said that I had successfully activated the device, but then proceeded to present me with an message that "something went wrong" and that I had to call to speak to a live representative to complete the activation. I proceeded anyway, and everything worked find despite this message. For some people receiving this message would have stopped them in their tracks requiring a call, which most certainly muddies the activation experience. Following completion of the activation wizard, I following the directions to add money to the account. Virgin clearly has an objective to get you to use a credit card, as the credit card option is quite in your face and very prominent throughout the My Account screen flows. I was able to quickly find the option to topup using a topup card, and proceeded to redeem the $40 topup card that they had given me. It's inferred that any Virgin mobile topup card can be used to add money to the account, which I think is a great feature. Cricket, on the other hand, requires that you buy a specific broadband topup card, which can complicates the purchase experience, and can cause a lot of aggravation if you're not careful. Once successfully adding the money to the account by entering in the PIN number on the back of the card, I was able to select the $40, 30 day unlimited plan. The other option was the $10, 10 days, 100MB plan. Note that the $20, 30 days, 1GB plan is only available for modems purchased at Walmart. For those not on an unlimited plan, being able to easily monitor your usage is extremely useful. Even with an unlimited plan, with the "reasonable use" clause, you can see if you're going over the 5GB threshold, after which they can throttle or shut off your service. At first I had trouble connecting because I confused the MiFi admin login password that I had setup with the password for the modem itself (the one printed on the sticker on the back of the MiFi device). Once I figured out that [stupid!] mistake, I was able to connect with no problems to my two laptops with ease (as expected). The default SSID of the Broadband2Go MiFi modem is "VirginMobile MiFi2200 EDC Secure". I recommend always keeping password protection on to ensure that others don't use your connection, which could result in speed impacts, as well as consume your MB allowance (if you're not on the unlimited plan). While the setup process was relatively smooth, when all is said and done, speed is really going to drive the overall long term experience, and determine how happy we are with the product, and whether we're going to continue using it and recommend it (or not) to others. Let's just say that this is where I experienced mixed results with Virgin broadband. I used speedtest.net to test actual speed, although having had a lot of experience with mobile broadband, I can judge performance quite well via simple Web surfing. The speed registered from 1XRTT speeds (300-400 kpbs) to blazing fast EVDO RevA speeds (800 kpbs - 1.7 Mb/s!). To be fair, I have to disclose that I've been having speed issues (not coverage issues) in my house with Sprint over the past 6 months. 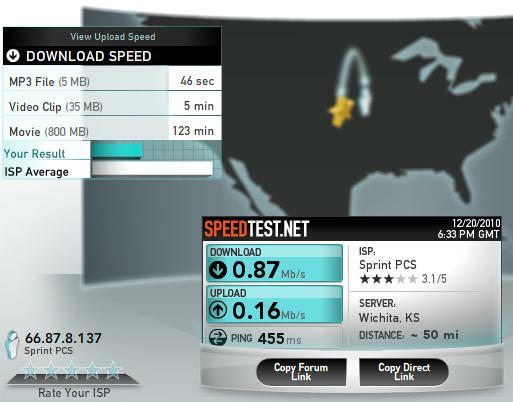 After over three years of using Sprint broadband service in my home with no issues, in mid-2010 I started experiencing what can only be described as extremely schizophrenic performance. At one point earlier in the year, I spent hours on the phone with advanced Sprint tech support. They blamed the performance, and even some outages, on their work to upgrade the network to 4G (WiMAX), however, performance has yet to return to normal, and it's likely that I'll need to revert to a cable modem to ensure consistent speeds. Anyway, the point being that testing in my home is not likely typical, but is indicative of inconsistent performance you might find with Sprint depending on the coverage/tower performance/congestion in the areas where you would use these devices. I was able to conclude, however, that the Virgin broadband performance from what I can tell is identical to that of Sprint's postpaid mobile broadband products. So while you won't be able to roam with a Sprint prepaid broadband product, when you're in native Sprint coverage areas, you'll be getting the same performance as you would on postpaid. Of course, there may be quality of service prioritization that Sprint imposes that could impact its prepaid products/brands, however, from my experience comparing Sprint's MiFi device to Virgin's Broadband2Go modem, they both performed equally. I found that battery life never quite made it to 4 hours, but usually more in the 2.5 - 3.5 range. One thing to note, though, is that reception in my house (where I was mostly testing it) is not fantastic. This can drain the battery faster as the modem intentionally boosts its power in an attempt to get a better signal. Generally speaking, however, as much as I love MiFi devices, they do represent yet another battery to have to think about compared to PC Card and USB modems. Note, also, that by default when the device is plugged into your computer via USB (i.e. charging), the WiFi capability is disabled. I found instructions to disable this limitation (i.e. enable WiFi while plugged in), however, I have yet to try it. Given all of the negative feedback/reviews regarding people having difficulty using VPN using Virgin Broadband, I was eager to test this. It turned out to be a very quick test as I launched my VPN client and logged on with no problems at all. Now that's not to say that everyone will have this experience. Depending on how your IT department has configured its VPN client, I understand that this can be more challenging, and perhaps require playing around with some additional manual settings. For me, however, it was a seamless experience with no issues to report. NOTE: In January 2011, Virgin announced that it was putting a cap on its unlimited Virgin broadband plan at 5GB. Most other prepaid and postpaid carriers have already done the same in an attempt to maintain network performance for the majority of its users who don't abuse the network. Virgin won't be shutting off your service after 5GB, however, they will be reducing speeds to the point where the average user will certainly notice massive speed degradation. I would argue that it's so poor at that point that it becomes virtually unusable. If you're using an email client like Outlook, you should be just fine, however, even browsing basic Internet pages will quickly become frustrating. While I understand the need to protect the network quality, with today's usage trends, I believe that 10GB is a much more reasonable limit to set. Needless to say, I expect that advertising its Virgin broadband plan as being "unlimited" will disappear before too long. Overall I found the Virgin MiFi Broadband2Go and service to be very good, and certainly on par with that of Sprint in terms of coverage within the native Sprint 3G network and speed. If you're the type of person who primarily uses email and Internet, with the occasional YouTube video clip (i.e. not full movies), not only will the speed be more than adequate (assuming you have coverage where you use it), but the 5GB limit that Virgin now has on its "unlimited" plan should also be plenty. If, however, you want to stream videos, you'll need cable, DSL, or 4G wireless to get satisfactory performance. Generally speaking, I don't have any major issues or complaints. However, I need to note again that due to the fact that I was using the MiFi device, I'm unable to comment on the USB modem installation issues that people took issue with. Should I get the opportunity to test that device, I will post an update here. If you have your own experience with the Virgin Mobile MiFi device, Broadband2Go service, or would like to share comments regarding this Virgin broadband review, please link over to Virgin Mobile MiFi, and scroll to the bottom of the page where you'll find a "Click here to post comments" link.